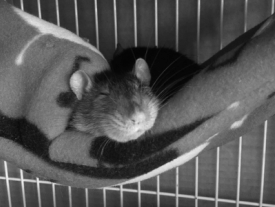 ﻿﻿I've been sewing hammocks for my rats for over 10 years. My hammocks are soft, cozy, comfortable, and have pockets that provide a place to hide and sleep. I use fabrics that won't fray when chewed and metal grommets and hangers that deter them from chewing the corners down. I've found that my rats will typically create their own "windows" in the corners (under the grommets) so that they can sleep with their noses out... "windows" that make it easy for them to peek their heads out when they hear me approaching.